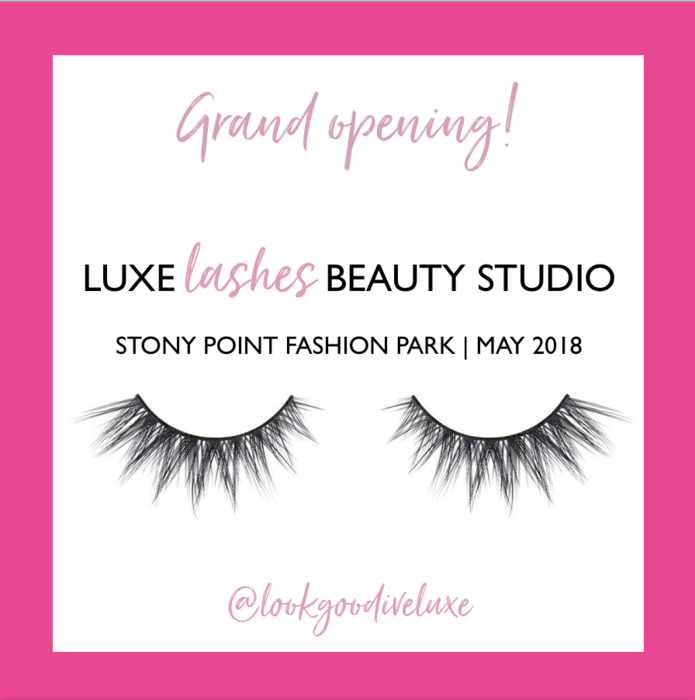 Luxe Lashes celebrates the grand opening of their new second location at Stony Point Fashion Park in Richmond, Va. Click to see the week-long celebration of beauty service specials! The time has come and I am so excited to welcome you to our new Stony Point Fashion Park location! May 1: We have created an image for you (below) to help spread the word on your social media profiles! When you come into the new store, show us how you shared the image and receive 15% off your service if you book an appointment! May 2: We will be handing out goodie bags to the first 25 beauties coming to see our new space! If you make an appointment during your visit, receive 15% off upon booking your service! May 3: Luxe Ladies Night Out - All day sips and bites! Come into the store with your fellow beauty lovers and book an appointment at 15% off AND 15% off all in-store merchandise! May 4: Stop by and enter your name to win a $100 Stony Point Fashion Park gift card! The winner will be announced May 5th. If you book an appointment while in the store, receive 15% off upon booking your service! May 5: Bring in your receipt from any Stony Point Fashion Park fashion or beauty retailer and receive 20% off your service! With a new studio, comes new beauty artists! We are so excited to introduce our newest lash artist, Anesha, and our new threader and microblading artist, Genai! Walk-ins will be welcome, and as always, we can’t wait to help more of Richmond Look Good and Live Luxe! A Lash Into The Past Pt. I: Lash Extensions!